Hosted Virtual Desktop (HVD) or Virtual Desktop Infrastructure (VDI) deployments are starting to emerge. 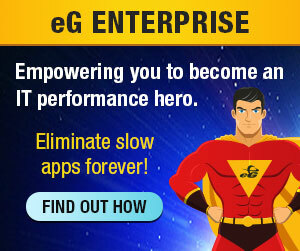 At eG Innovations, we have been involved in some of the largest VDI deployments in the world over the last year. VDI plays to our strengths. For several years, we have had one of the best Citrix XenApp monitors in the market. Over the last three years, we’ve specialized in monitoring the virtualization platforms (VMware vSphere, XenServer, etc.). VDI combines the requirements of these two worlds! For monitoring VDI effectively, you need to monitor users and their accesses to virtual desktops. Since these desktops are hosted on the virtualization platform, it becomes important to monitor the virtualization tier as well. Further, since VDI is delivering a service, you need to be able to monitor the components of the service end-to-end, including the network, the user terminals, the connection brokers, the SAN or NAS, etc. Business service management is yet another forte of ours. No wonder then that we have a fairly comprehensive offering for virtual desktop service monitoring. One of our strategic partners in the VDI space is Computer Sciences Corporation (CSC). CSC had already been through some initial deployments of VDI before they came across our monitoring solution offering. This new case study “CSC Solves Challenge of Monitoring Dynamic Desktop VDI Service with eG Enterprise and eG VDI Monitor” explains why they chose the eG VDI Monitor and how they are utilizing our solution as part of their VDI service offering. To read this and other case studies, click here.